My cruelty free collection of nail polish is always growing. There’s nothing better than getting a relaxing pedicure or treating yourself to a manicure at your favorite spa. The local spa I frequent has so many VEGAN and CRUELTY FREE options that it’s insane, but I still like bringing some of my own shades when it comes time to pick a color. My new fave? Surya Brasil Exotic Animals Nail Polish! Surya Brasil Exotic Animals Nail Polish is inspired by nature (love!) and is a 7 free nail polish which means there is no camphor, DBP, formaldehyde, parabens, toluene, beeswax, ingredients of animal origin, and no animal testing. Now that I’m pregnant not only am I looking at more cruelty free items, but I’m also looking closely at their ingredients to make sure toxins are virtually nonexistent. Since the holidays are almost upon us, I chose to showcase Electus Parrot (a deep dark red) and Pampas Cat (a neutral tan), each $12, topped with their extra shine topcoat ($12). Right away I fell in love with the Surya Brasil Exotic Animals Nail Polish packaging. The wooden tops of the polishes are sturdy and unique and the designs on each bottle match the animal the shade is named for. Furthermore, the brush on the Surya Brasil Exotic Animals Nail Polish collection is WIDE! I love this for when I’m doing my own nails because I feel like there is more control over the product. No bubbles or splatters here. The polish itself has no smell and goes on so smoothly. Electus parrot, on my preggo toes is bright and fun. The tan, used on my fingers was rather light (I did a triple coat to get some opaque shade), but I still really liked having a subtle shine on my nails. I’ve had the polish on for two weeks with the Extra Shine Topcoat and my toes and fingers still look amazing. 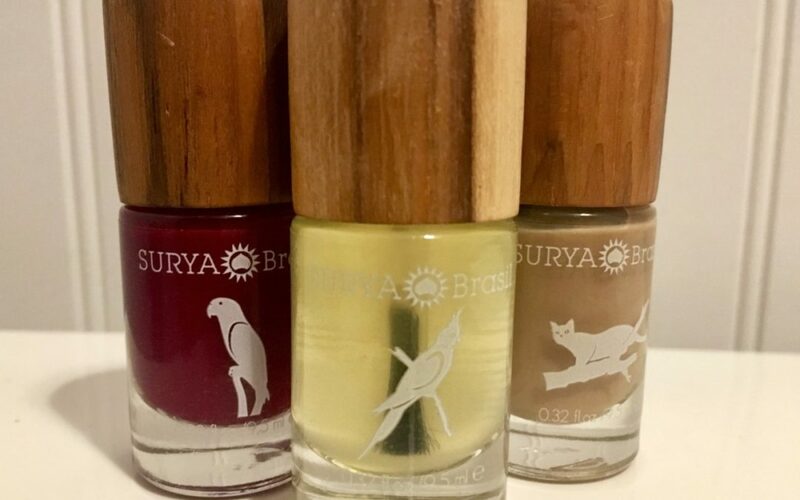 You can purchase Surya Brasil Exotic Animals Nail Polish from their website and follow them on Instagram to learn all about their amazing natural, organic, and earth friendly products! Bonus when you buy their polish? You might also get an organic nail file and orange stick like I did! Which colors are you digging for the holiday season? Note: This post is not sponsored. All thoughts are unbiased and my own. Product was provided for editorial purposes.